HIGH QUALITY: Strong high-grade particle board won’t bend or bow from heavy objects and is covered by durable Dakota oak structured foil finish veneer that is resistant to stains, scratches and water damage. 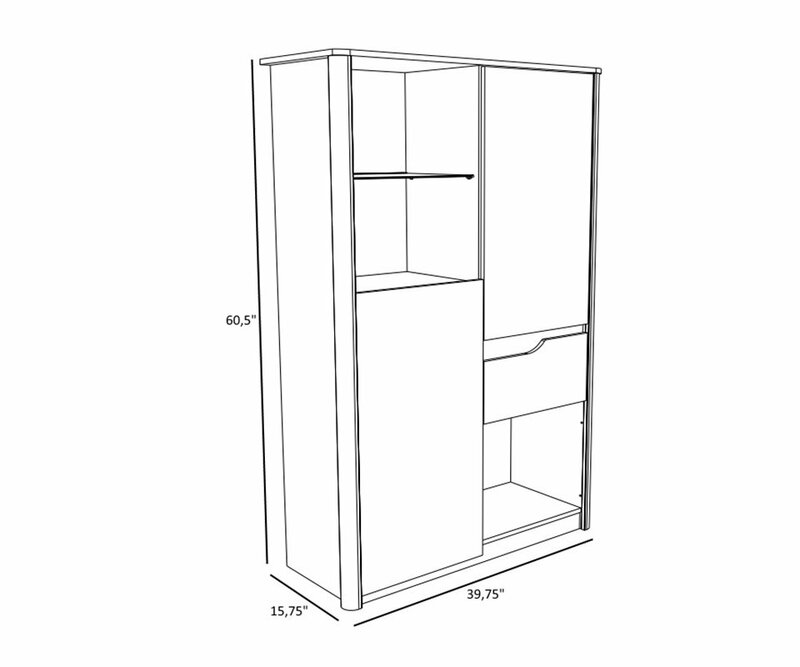 CONTEMPORARY STYLE: Sleek, modern cabinet style, with staggered open shelves and cabinets, and curved cutouts instead of handles or knobs, is a modern take on the traditional hutch for storing dishes, glasses and silverware. COLOR: The Wendy collection is available in a gray-beige natural oak veneer foil finish. The finish blends with many other hardwood finishes for creating an eclectic living/dining area. STORAGE: The Wendy Dish Cabinet has two closed cabinets with shelves for dishes, and two open shelf areas, one with glass shelf for glassware, and the other a large square shelf area for larger items. There’s a roomy drawer for flatware and serving pieces too! 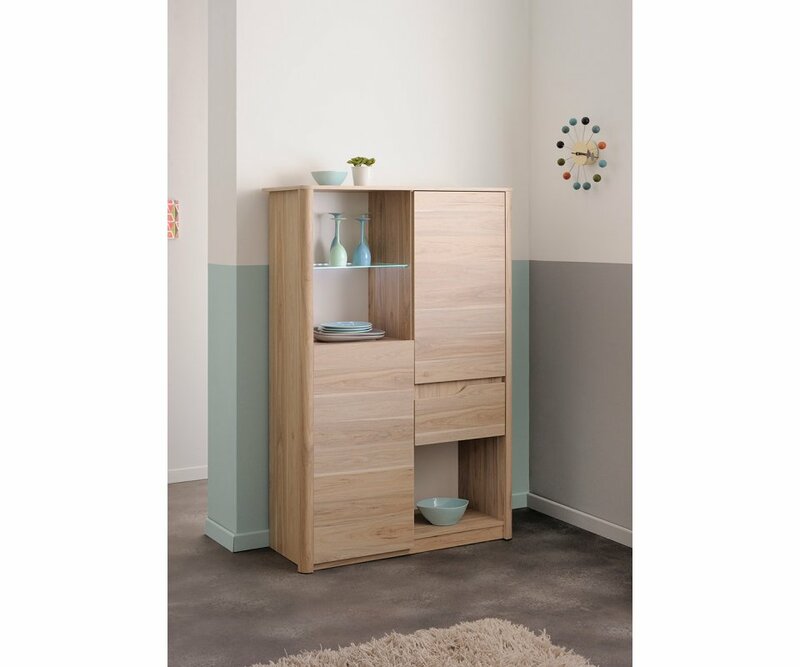 ECO-FRIENDLY: Manufactured by Parisot Company, the dishes cabinet is made from eco-managed forest wood, is processed with low solvent emissions, and is packaged with low-waste materials. They are an accredited Green Way company. 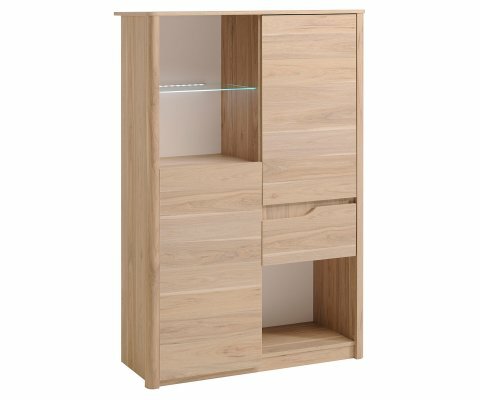 QUALITY CONSTRUCTION: Best quality particle board is covered with durable Dakota oak structured finish foil veneer, resulting in sturdy furniture that resists stains, scratches and water damage.DESIGNER STYLE: Streamlined and sophisticated, this style will blend with most home décor styles. Designe..
MODERN STYLE: Sleek slim legs give the Wendy table a streamlined, sophisticated look. This modern contemporary table is as comfortable in a country kitchen as it is in an urban loft!QUALITY CONSTRUCTION: Made from high-grade particleboard material, the Wendy table is covered with a Dakota oak struc..
HIGH QUALITY: Made to be sturdy and able to hold the weight of a heavy television, the Wendy TV table is manufactured from high-quality particleboard, and covered with a beautiful and durable foil-finish veneer.DESIGNER STYLE: With sleek lines and curved cutout design for opening drawers, the Wendy..